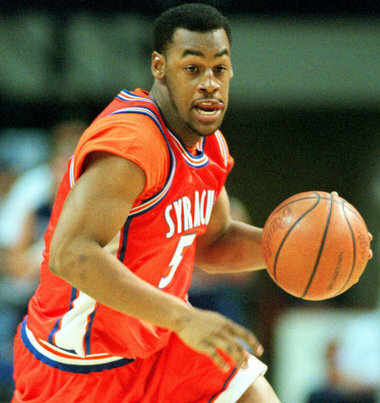 Donovan McNabb played two seasons for the Syracuse basketball team as a reserve guard. More significantly, he was the best quarterback in Syracuse football history. In terms of basketball, McNabb was a walk-on, playing for Jim Boeheim after the football season ended. McNabb had been a star basketball player at Mt. Carmel High School. His freshman year he was a reserve guard on the team that went to the National Championship game, only to lose to Kentucky. McNabb was often credited with strong clubhouse leadership and breaking the tension among this hoop teammates during the post season. His sophomore season, McNabb was a more significant contributor to basketball. With his explosive athletic skill he was able to provide Syracuse with valuable minutes. In the annual big game against Georgetown, he had a career best 10 points including some impressive offensive rebounds and a big block of 6'9" Jahidi White's dunk attempt. After his sophomore season, he would leave hoops behind, to focus on his football game. As a freshman, McNabb was in a tight battle in the preseason to earn the starting quarterback position with fellow freshman Kevin Johnson. McNabb would win out the position only a few days before the regular season would begin; Johnson would move to wide receiver where he would have a successful college and NFL career. McNabb exploded on the scene his freshman year, running Syracuse's pass option offense to perfection, connecting with wide receiver Marvin Harrison on several big plays. Over his collegiate football career, McNabb would be named first team All Big Conference Quarterback four times, and the conference's Offensive Player of the Year three times (1996, 97, and 98). He would lead Syracuse to a 35-14 record (23-5 in Big East Play) over four years and to four bowl games (Gator, Liberty, Fiesta, and Orange Bowl). He set the Syracuse and Big East record of 77 touchdown passes, 8389 passing yards and 9950 total yards of offense. He also set the Syracuse record for career passing efficiency at 155.1. In 2000 he was name the Big East Conference Player of the Decade. He was a fantastic scrambler, who could run the option play, and throw the deep pass. His signature play was a rollout to his right where he would then throw back across his motion to the tight end who had snuck out into the opposite side of the end zone. In 1999 he was drafted as the 2nd overall pick in the NFL draft by the Philadelphia Eagles, and as a rookie he became a starter half way through the season. He was named to five consecutive Pro Bowls (2000 to 2005), and led Philadelphia to four straight NFC East Division Titles (2001 to 2004), and to five NFC Championship games (2001, 2002, 2003, 2004, 2008).. In 2004, he led the Eagles to their first Super Bowl appearance in nearly 25 years, losing a tight game with the New England Patriots. That season he threw for 31 touchdowns and 3,875 yards, with only 8 interceptions. The Eagles traded McNabb to the Washington Redskins prior to the 2010 season, and he would finish his NFL career with the Minnesota Vikings in 2011. In 2002 McNabb was named to the board of trustees for Syracuse University, the youngest individual ever named to that position in the University's history. In 2000 he was named to Syracuse University's All Century Football Team.